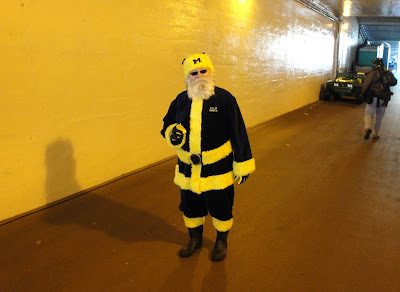 Like we've said before, Michigan Santa doesn't care what holiday you celebrate, just as long as your devotion to the Maize & Blue is true. There's no need to tell him what you want, he already knows. A top 3 recruiting class, a win against the Buckeyes and a trip to Pasadena are must-haves on any Wolverine's wish list. It's slow down time around this site right now. Posting will all but cease unless something huge happens. To hold you over, here's a double-shot of Recruitaholics! See you later this week! Ho ho ho! Merry whatever holiday you celebrate!